There is evidence that the skilled to unskilled wage rates were rising in the 1980s and at the beginning of the 1990s. This can potentially be explained by a Heckscher-Ohlin framework where economic integration implies that the advanced countries specialize in skilled-labour-intensive industries and developing countries in unskilled-labour-intensive industries. However, actual trade figures show that import penetration was particularly high in the skill-intensive industry segments also for trade integration with developing economies, which would imply a falling relative wage rate of skilled workers in the advanced countries in the Heckscher-Ohlin framework. 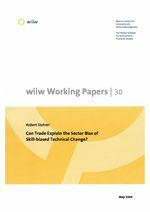 If, however, these trade patterns induce relatively stronger skill-biased technical progress in the skill-intensive sectors, then the effect of trade would again be a potential reason for the widening of the wage differential between skilled and unskilled workers in the advanced countries. This paper presents some evidence that (negative) employment effects or positive productivity effects due to trade integration are particularly strong in the skill-intensive industries which supports the hypothesis above.